iBeacon, the evolving technology that harnesses the advantage of Bluetooth Low Energy (BLE) to provide location based mobile application services to iOS powered devices, iPhone, iPad, iPad mini and iPod Touch. A beacon is a Bluetooth transmitter which can be placed anywhere remotely. Applications installed on an iOS device will look out for this signal and will receive or send information. iBeacon however is in its developmental stages. The real world application and possibilities are still being tested. 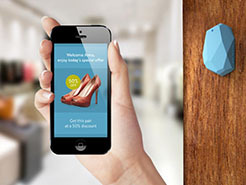 Indoor shopping and deal alerts are expected to be the two areas in which the iBeacon concept could workout well. Augmented Reality blurs the line between what's real and what's computer-generated by enhancing what we see, hear, feel and smell. Augmented reality is changing the way we view the world -- or at least the way its users see the world. Picture yourself walking or driving down the street. With augmented-reality displays, which will eventually look much like a normal pair of glasses, informative graphics will appear in your field of view, and audio will coincide with whatever you see. These enhancements will be refreshed continually to reflect the movements of your head. KPGTC can help you realize your AR Application.